This picturesque 1926 Colonial Revival-style inn is centrally located in Amherst Town center and on the doorstep of Amherst College. The interior spaces were recently restored: gleaming hardwood floors are offset by white wainscoting and gilt-framed paintings dot the walls. Graceful high-backed armchairs surround the fireplace in the lobby, and the library has floor-to-ceiling shelves and plenty of space for relaxing or gathering with friends. Each room in this historic inn has its own character: some have sunrooms, some have gas fireplaces or views of historic Amherst. Rooms with fold-out sleeper sofas are a nice option for families. Modern essentials include free wireless internet and a state-of-the-art fitness room. The downtown Amherst location means you can walk to everything: shops, restaurants, and museums—or the big game at Amherst College. Have a drink or a full dinner from 30Boltwood outdoors on the covered patio. There's plenty of cushy seating around the fire pit. 30Boltwood serves upscale farm-to-table cuisine—think farm-raised duck from a local farm with wild mushrooms and burrata with black figs. Dine on leather banquettes, at the long copper-topped bar or outdoors on the patio. In-room dining is available. 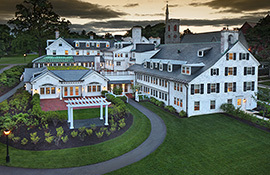 The Inn is on the Amherst Common, walking distance to restaurants, shops and the cultural offerings of Amherst College, and centrally located in the Five College area near the University of Massachusetts Amherst, Hampshire College, Mount Holyoke College and Smith College. Cancellation required 48 hours prior to arrival.